Levi ’67 and Lillis Troyer accepted the Margaret Martin Gehman Philanthropist of the Year award during Friday evening’s annual donor appreciation banquet at Eastern Mennonite University. 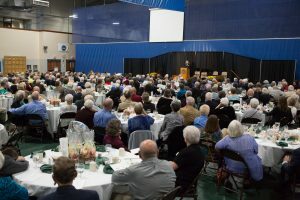 During the evening event, held in EMU’s Yoder Arena, university officials thanked more than 350 donors in attendance for their support that resulted in a year. The university received over $9.1 million in gifts from individuals and private foundations, topping the prior record set in 2002 of $7.7 million. The Troyers represent a six-decade-long legacy of connection and engagement to the university, said President Susan Schultz Huxman. Professor Margaret Martin Gehman, the namesake and first recipient of the award in 2005, was present to join her in honoring the Troyers. The award recognizes generous and exemplary leaders whose advocacy and support for EMU has had a transformational impact on the university’s mission. President Susan Schultz Huxman addresses donors at Friday evening’s appreciation banquet. The couple has funded scholarships for students with financial need as well as supported the EMU educations of their children and grandchildren. They have shared knowledge and expertise through terms on the EMU Board of Trustees, Levi from 1995-99 and Lillis from 2006-10. Additionally, their influence can be seen in many capital campaign projects since the 1980s, including the development of central campus, the seminary building, Northlawn renovations, and both phases of University Commons. Their long relationship with the university began in the mid-‘60s in Ohio, “when Lillis and I loaded our station wagon and gathered up our two boys, to head to EMC, not knowing, you know, what we would encounter, and I must say that we met up with some extremely helpful and courteous people here … We felt very much at home right from the very beginning,” Levi Troyer said. As he accepted the award, Troyer acknowledged the many wonderful people who “helped us along the way to get to where we’re at this evening.” His wife and partner of 57 years, Lillis, has been a support and encouragement and perhaps the most deserving to receive the award, he said. And his father-in-law Emanuel Mullet, an entrepreneur in the Holmes County region, passed on his own time and treasure to the couple. This is not the first recognition for the couple’s numerous philanthropic endeavors. In 2014, they were recognized with the Holmes County Chamber of Commerce Lifetime Achievement Award for contributions to area business as well as education, mission work, community service and economic development. The couple founded Walnut Hills Retirement Community in 1971 and were owner-operators for 37 years before creating a non-profit organization to run it (Walnut Hills is now an affiliate community of Greencroft Communities, based in Goshen, Indiana). They also own Der Dutchman Restaurant. 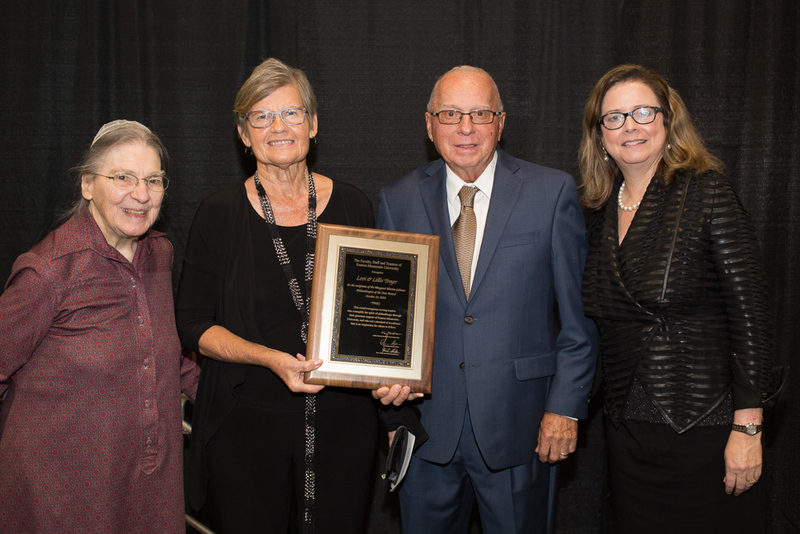 Other recipients of the Margaret Martin Gehman Philanthropist of the Year Award include Lewis and Mary Coss (2007), Robert and Eloise Hostetler (2008), and Henry and Charlotte Rosenberger (2014). Congratulations to you Lillis and Levi! Thank you for your generosity to EMU!